Published by: Bronze Publishing, Inc. This is a favourite book of both my daughter and my niece. It is a little Japanese hardback that shows a number of inanimate objects getting into their futons, ready for bed, including an ice cream cone, an octopus, and a roll of toilet paper. 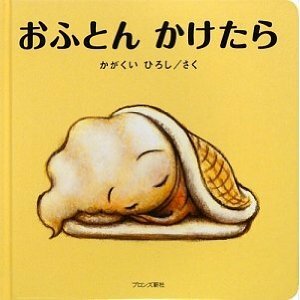 Toddlers all over Japan love this book, but it is also great for those learning to read Japanese, adults and kids alike. My son reads it to his sister and cousin over and over, and those adorable eyebrows means no one gets tired of it. It also introduces onomatopoeia, which are so integral to Japanese children's literature and to the language itself. 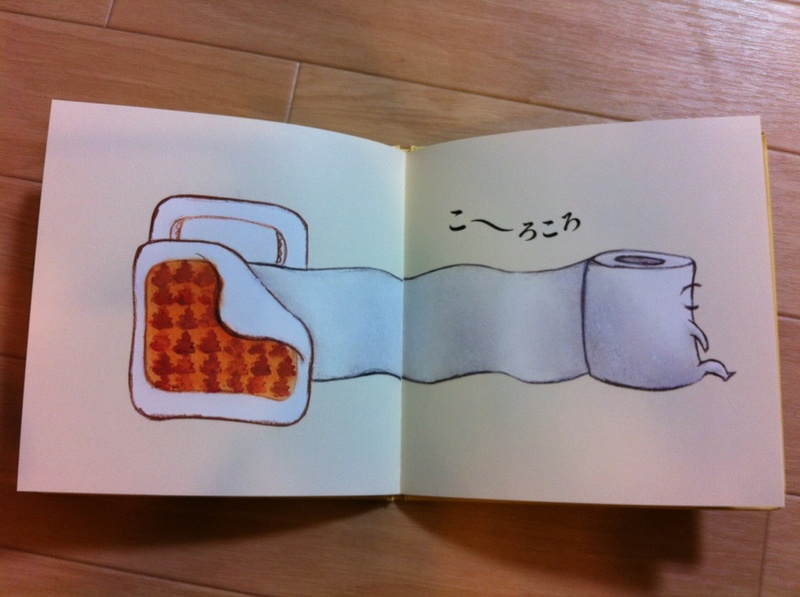 Anybody could understand the rolling action inherent in the word ころころ (korokoro) by looking at that little TP rolling out of bed. I would recommend this to new parents trying to raise bilingual babies overseas, as well as students of Japanese as a foreign language. When I reviewed the fabulous Sora and the Cloud I talked about how much I love those simple brushstrokes that are so expressive - the single line of these faces and in Sora are so adorable and heartwarming. I liked them so much this is what I chose to recreate for the Edible Book Festival hosted by Playing by the Book. Mine was #18, but there are over 70 entries and so fabulous and creative! Please go check out the winners that were announced today! The cover of the book actually portrays an ice cream cone which we tried first but that did not work so well as it kept melting before I could apply eyebrows and take pictures! So then we tried my beloved gyoza, but it wouldn't have tasted so good with the chocolate and sweet pancake so I had to change it all up! In the end this ended up being thinly sliced fried eggs (kinshi tamago) covered by a savoury pancake (from a watered down version of the recipe in Mama Panya's Pancakes) that encloses a gyoza dumpling with nori seaweed eyebrows and eyes. The seaweed is stuck on with painted-on mayonnaise. We had so much fun with the Edible Book Contest, I hope to do it again! Here's hoping the lovely Zoe makes this an annual event! Need that book for Little S! I love your edible cover too - I would have felt guilty tucking in though, just too cute! Yes please, add me! I would be pleased! It was yummy, I had no compunctions about eating it! Sent! I couldn't find anywhere to send a message along with it so just in case I have blue sky and blossoms as my "cover pic" at the moment.